Are there any age limits for the patients? Every single case in unuque. The clinical decicions consurning the treatnent are taken by the team of doctors, based on the information of the detailed diagnosis process. Patients from 11 up to 87 years old are treated in the clinic. I already have a diagnosis why I need to do yours too? The first step to recovery is identifying and understanding the cause of your health condition through our unique diagnosis procedures. The new patient process begins with a one on one detailed consultation to help the doctor understand your condition and symptoms. Once the consultation is completed, a comprehensive examination consisting of orthopedic and neurological tests are performed to analyze and locate damage and abnormal functions of the spinal system. Digital posture analysis and x-rays are then performed and analysed using 41 measurements and 23 angles to help locate the cause of your spinal conditions and symptoms. 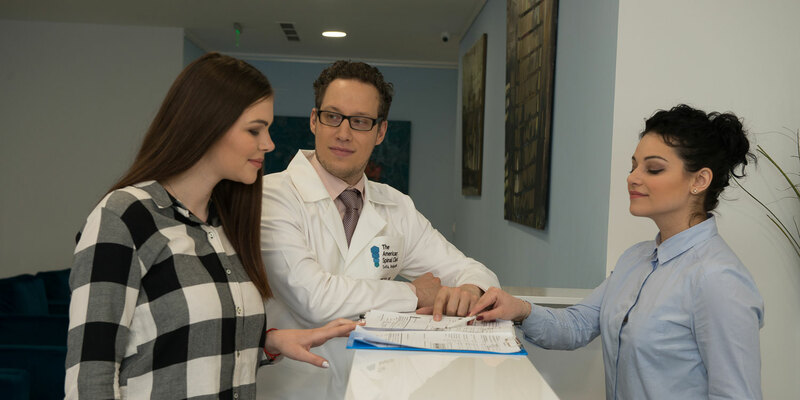 After our team of Doctors (Doctors of Chiropractic, Doctors of Physical Medicine, Doctor of Radiology, Doctor of Cardiology) study your case, you will then receive a report of findings. This is when the doctor will go over what he found is causing your health conditions and explain your individualized treatment plan and recommendations. I already have an MRI. Why is it necessary to take x-rays? Sitting x-rays allows us to test the weight bearing function of the spinal structures and identity the patients individual spinal dysfunctions causing the patients symptoms and functional loss. We utilize sitting x-rays because it put 50% more stress load on the spinal structures and allows us to identify and diagnosis spinal system damage and failures that do not show up in recumbent MRI and CT scan or standing x-ray. What is treatment process in the American Spinal Clinic? Are there any spinal conditions that can not be treated in the clinic? Unfortunately, there are conditions that can’t be treated in the American spinal clinic. To make sure we can help you, we have a unique and detailed diagnosis process. You can call to +359 700 11 285 or send an email to frontdesk@americanspinalclinic.com and our colleagues will give you detailed information about the conditions that we can treat. Do you work with National Health Insurance Fund? The American Spinal Clinic does not work with the National Health Insurance Fund. Do you have partnership with Insurance Companies? We do not have partnership with insurance companies but we provide any necessary documentation in order the patient to be reimbursed. Do the patients need to be reffered by GP?